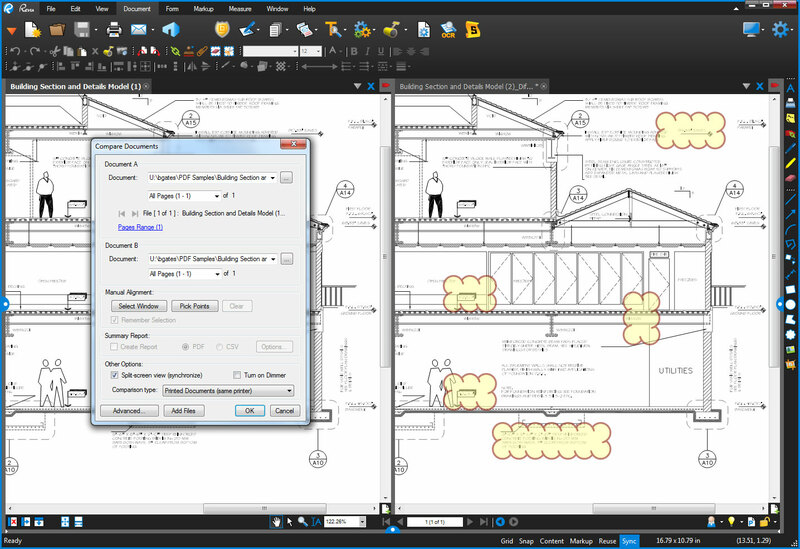 The Bluebeam Revu 12.1 update adds some handy measurement options so estimators can save some time. Simply calibrate as usual and check the new independent units checkbox. This offers the choice of units you want to use for length, area and volume measurements. In the sample below I’ve opted to measure square yards for area as I am taking off the flooring and cubic yards for the stairwell concrete slab while leaving the length a foot and inches measurement as usual (double click for a larger image). You can change between metric measurements and English in the same takeoff with ease should you need to. Let Bluebeam Revu do the conversion for you! If you have a previous version of Revu (11 or earlier) you may need to renew your annual maintenance to upgrade to Revu 12. Please check with your systems administrator or email me your Revu Serial number and I’ll check it for you. If your annual maintenance is up to date, please refer to our previous blog post, How to upgrade Bluebeam Revu 11 to Revu 12 which includes hardware/software considerations before upgrading to Revu 12. If you aren’t likely to commit these to memory, you can still work more efficiently with these helpful toolchest estimating tool tips. A Markup and its layer can be defined in the toolchest. To add a layer to a markup, right click on your toolchest markup tool and choose layer. Common uses of layers for estimators is to name each layer by trade or specialty. This way you can toggle them off and on, which is especially helpful when you have many measurements in a small area. This also makes for a great “Legend” custom markup tool you can place on your estimating take-off plan set. Not sure how to make this color coded legend as one tool? Tune in for next week’s Bluebeam tip and I’ll cover how to group markups. Revisions and Addenda are common in construction projects. When conditions and ideas change, so do the plans. When estimating the financial impact of these changes, subcontractors are often pressed for time and need an efficient way of locating the differences between plan sets. Unfortunately, as is often the case, neither the architects nor general contractors have clouded all the changes for you. So do you pull out the old light table? There’s a better alternative. Whether you have a clean vector drawing or plans scanned to PDF you can use Bluebeam Revu’s compare documents to cloud the differences and get a side-by-side comparison, or overlay the plan sheets. 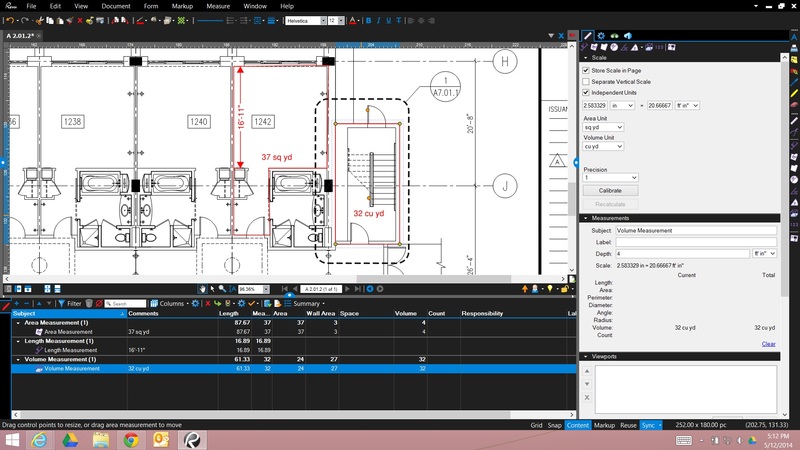 This video will show you what Bluebeam does, and how to do it! 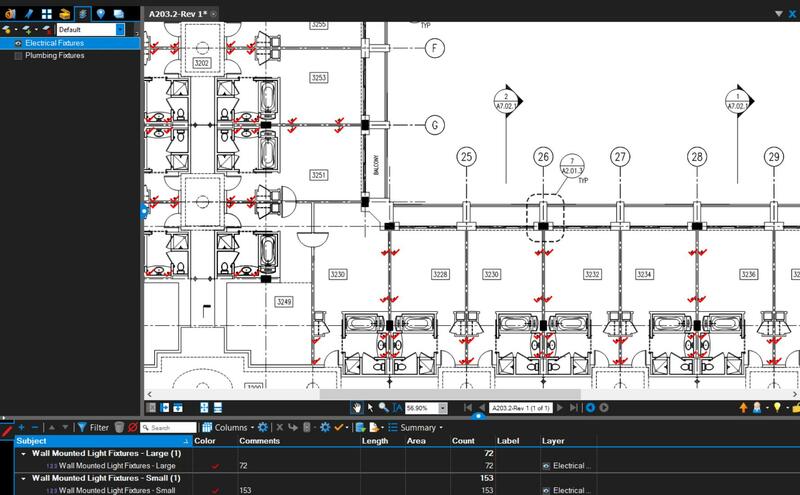 Bluebeam Revu’s measurement functions provide quick methods for estimators to take-off length, area and quantities. Painters, drywallers and other specialty trades often need to calculate wall area quickly and efficiently on a construction project. With Bluebeam Revu you have three take-off choices. With options 2 and 3 there will be further calculations necessary to account for doors and windows. Knowing that you’ll all want to try these faster options and get more bids completed, I’m providing this handy reference document explaining the process using the Bluebeam Revu Measurement tools. You can download this free PDF (and yes, you can view it first because I’m using Box.com). Disclosure: My firm, Hagen Business Systems Inc is a Silver Level Bluebeam Partner and sells Bluebeam Revu to architects, engineers and contractors throughout the United States. Posted by carolhagen in BIM, CAD, Construction Industry - Software, Document Imaging, estimating. Construction collaboration with PDFs has been utilized poorly. Even with the Microsoft Office 2010 release that gives you the ability to convert documents to PDF built-in, it’s lacking when it comes to collaboration for the AEC Industry. To help change that I’ll share some best practices and features that contractors, architects and estimators perhaps weren’t aware of. What PDFs do best is share documents in a format that everyone can access. 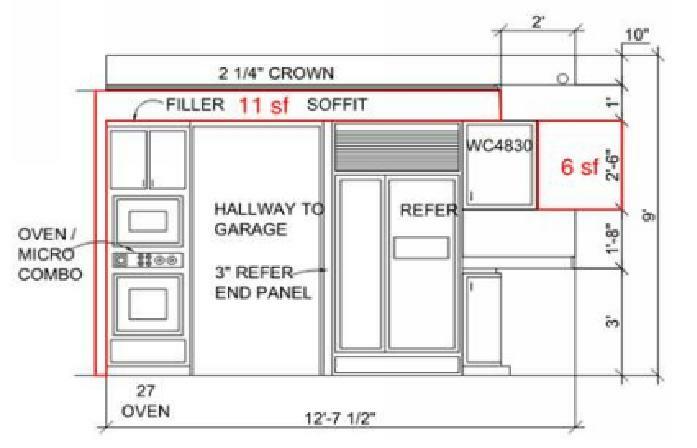 Print to PDF gets the document out of that technical construction software package (AutoCAD, Revit, etc) and serves it up for every construction team member, without needing the same software. This will be a series of posts that will discuss construction collaboration using PDFs for Estimating Takeoffs, Converting Large Format and 3D Drawings, AutoCAD and Revit Integration, Drawing comparisons, Hyperlink referencing, Tablet PCs, and Sharepoint. To be clear, not all these secrets are available in Standard PDF programs but are specifically designed for the AEC industry by Bluebeam, a PDF software firm which impressed me so much that I recently became an authorized reseller. 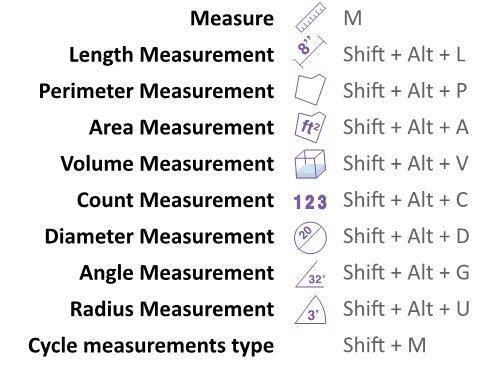 I understand that each person learns differently so you may want to download this tutorial Bluebeam Revu measurements takeoff or Watch this video (13 minutes) to see how the measurement tool in Bluebeam will give contractors the ability to perform takeoffs from PDF. 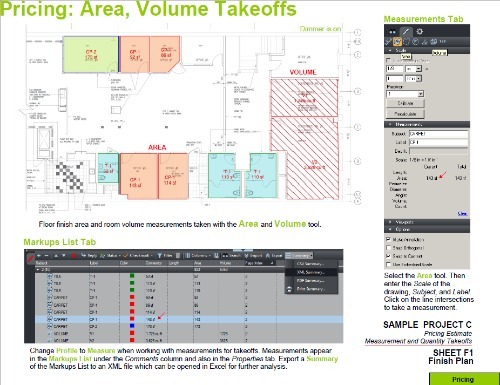 This includes: Calibrate the drawing or set the scale, use measurement annotations for area, length, volume and counts, and perform further calculation with your takeoff data. The video shows the takeoff details and how to group items into sections (this could be CSI codes, tasks or areas). There’s also the ability to price and export the details to a spreadsheet. 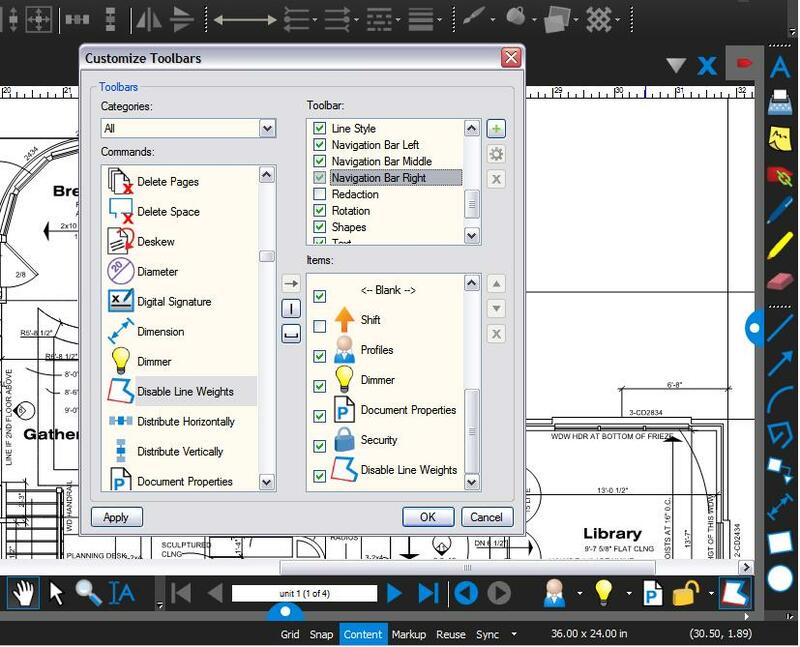 Realize this is just one secret to Bluebeam Revu and is built-in to every version Standard, CAD and eXtreme. You may also want to view a few more sample takeoffs like the one at the top. If you can’t wait to see all the “Secrets” for the AEC Industry, you may want to watch this overview video “Which Revu is Right for You?” to to see how Bluebeam can make your team collaboration and productivity improve with large format drawings, Revit, AutoCAD, Bentley Systems BIM and more. Or download a 30 day trial and take Bluebeam Revu for a test frive yourself. The Arizona Society of Professional Estimators and the American Subcontractors Association held a joint meeting in Phoenix entitled, “Building Technology into Estimates: Tech Features That Keep You Competitive”. James Benham of JBKnowledge did a fabulous job in engaging the audience and touched upon a variety of topics in the estimator’s toolkit, social networking and augmented reality. He showed applications that should at least be on your radar screen included Google Docs, Google Wave, SketchUp and using a BIM overlay on the job site. James talked about Facebook Groups being used to manage construction projects, EOS Advisor for seeing trends overtime and SmartBidNet to simplify Bid Management. I wonder if those in attendance have gone on-line to research these applications or if they’ve shared this information upstream yet? What I learned there is while I am always looking at technology, the majority of contracting firms are unaware of the new applications, and gadgets that will shape how we will work and communicate. 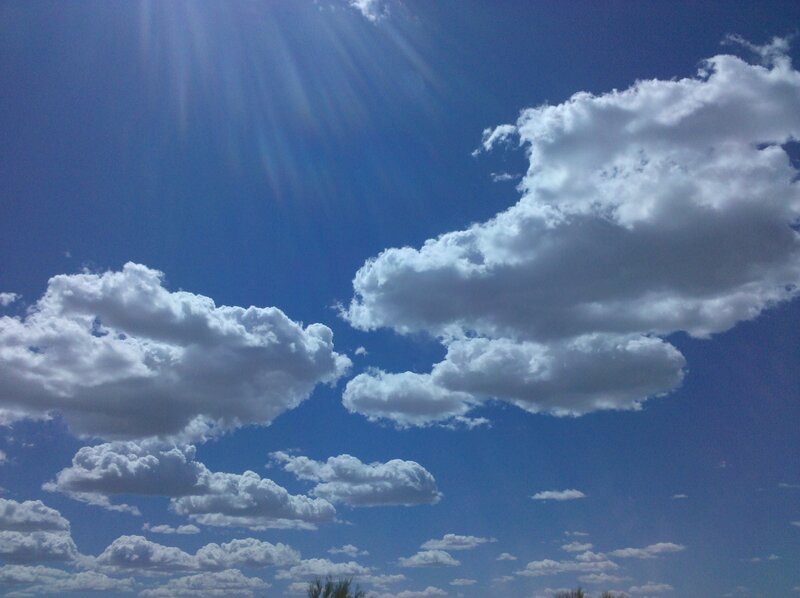 They depend on educational opportunities to inform them as most do not have the luxury of a Chief Information Officer. Every project that has received federal stimulus money will be audited. Be prepared. Inappropriate conduct is defined as severe, pervasive and unwelcome. You can reprimand a salary exempt employee (like a superintendent) with unpaid time if you dock them one(1) or more full days unpaid time. No half days allowed. Of course Julie touched upon FMLA, updated us on card check, what to have in your Employee Handbook or have as a written policy and many other topics like what to look for in a “He Said, She Said” situation. The most interesting item to me was the NLRB is clear in not allowing employers to prohibit employees from talking about raises. After all this information, I’ll see you at the water cooler.